This set of Manufacturing Processes Multiple Choice Questions & Answers (MCQs) focuses on “Electro-Chemical Machining – 4”. 1. What does faraday’s second law electrolysis state? Explanation: Faraday’s second law of electrolysis states that, when the same quantity of electricity is passed through several electrolytes, the mass of the substances deposited are proportional to their respective chemical equivalent or equivalent weight. 2. What is faraday’s first law of electrolysis? Explanation: Faraday’s First Law of Electrolysis states that, the chemical deposition due to flow of current through an electrolyte is directly proportional to the quantity of electricity (coulombs) passed through it. i.e., mass of chemical deposition. 3. In ECM, accuracy of the product is independent of the accuracy of the cathode tool. Explanation: The accuracy of the tool shape directly affects the work piece accuracy, since configuration of the cavity produced cannot be more accurate than the tool the produces it. 4. Which of the following materials can be used for making cathode tool? Explanation: The materials the find wide applications in the manufacture of tools for ECM are aluminium, brass, bronze, copper, carbon, stainless steel, monel and reinforced plastics. All these materials are easy to machine. 5. Conductivity of the electrolyte is unaffected by the loss of hydrogen during electrolysis. Explanation: Loss of hydrogen reduces the electrical conductivity of the electrolyte. Also due to loss of water by evaporation or being carried off by hydrogen gas generated, concentration of the solution increases which affects viscosity and electrical conductivity. 6. 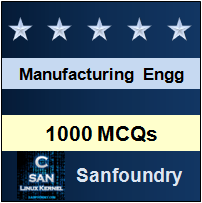 Which of the following manufacturing process is favourable for making tool for ECM? Explanation: Shaping the tool is usually not a problem since all the materials are easy to machine. Cold forging and electroforming are favourable methods of tool making. 7. Precipitate formation reduces the conductivity of the electrolyte solution. Explanation: Precipitate formation increases the effective viscosity and interferes with the process in the work-electrode gap. Also, salt absorption by the precipitate reduces the concentration, thus reduces the conductivity. Explanation: The solubility of the products of the reaction increases with rising electrolyte temperature. Also, increase in temperature of the electrolyte speeds up the electrode reaction and reduces the over-voltages required. iii. limit the rise in temperature of the electrolyte when working at higher current densities. 10. Increase in pressure of the electrolyte above atmospheric pressure is beneficial. Explanation: Increased pressure of the electrolyte above atmospheric pressure increases the boiling point of the electrolyte point of the electrolyte, reduces the over-voltage required at the tool surface and decreases the volume of generated hydrogen due to which it displaces less electrolyte permitting the use of higher current densities.